Super easy to toss together, three ingredients, four if you count the mint garnish, this is a recipe that’s perfect when you have to bring something for a food day, a party or a barbecue. Especially if you’re like me and forgot until last minute. Years ago, I had a girl’s night out and had promised to bring a fruit salad. Well, that entailed going home, picking up the kids, getting them fed and waiting for a sitter – and I was missing the key ingredient for the fruit salad I was planning! I rummaged through my fridge and came up with half a bottle of Pina Colada mix. A light bulb went off and I drizzled this over the salad. Muy compliments – I’m telling ya it is gooood! Feel free to make your own little mixture of coconut cream and pineapple juice, but sometimes ya just need a save. Avoid those prepackaged cut fruit at the store if you can – it is so much more inexpensive to buy your own fruit and cut it. And do just like the store does – use more inexpensive fruit (bananas, grapes) in abundance, and the more expensive ones in smaller amounts. 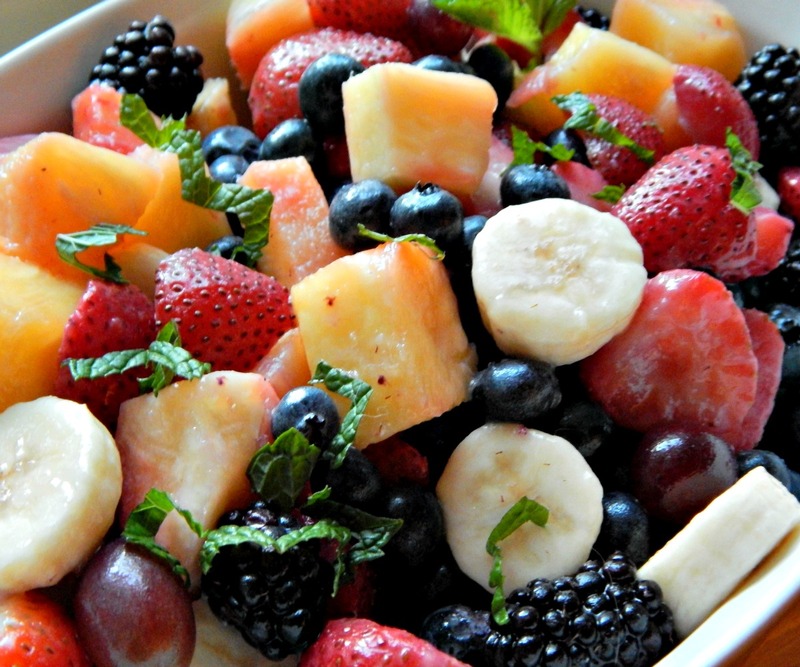 Even a few lovely berries make this salad seem luxurious. Leftover fruit salads may not look the most attractive but make great smoothies! Cut fruit, if time allows add to a strainer and strain excess juices. Place in a large bowl, drizzle with Pina Colada mix and shredded coconut. Gently toss and transfer to serving dish. Garnish with mint if desired. Do not make too far in advance, the mix is thin and will mingle with the juice of the fruit – it will taste great but not look the most attractive. This entry was posted in Click here for Fabulous Food Posts and tagged Bananas, Berries, Coconut, Easy Recipe, Fruit, fruit salad, Pina Colada, Pineapple, Salad. Bookmark the permalink. Amazing salad, and all those colors, beautiful! Thanks much! It’s really a fave and I just made it for our Thanksgiving dinner. Definitely need to make this sometime. Thanks for sharing! Thanks = it was so easy and of course, you’ll probably want to make Pina Coladas with the leftover! Thanks, Loretta~ I’m the same way…hard to eat or cook when it’s hot! You had me at pina colada and I also love the taste of fresh summer fruit! What a great idea to put them together! Thanks for sharing it with us at Fiesta Friday! Thanks so much Sandhya! Sorry to have been delayed in answering and thanks for hosting FF!! It looks too pretty to eat! Yummy! Thanks, I’m sure going to miss summer and all the wonderful fruits…In the midwest we’ll get some in the winter but they’re usually not all that great and goodness knows where they come from. Yum…and so cool looking. I am dedicated to only eating foods that take little or no cooking through the remainder of August due to the heat so this is just wonderful. Thanks for the great idea. I have come to the conclusion, Judi, that I just don’t drink enough! 🙂 I was amazed at the liquor store with everything they had, all the different mixes, boozes, etc! I only drink wine but when I need to buy mixes there’s enough choices to make your head spin 🙂 Even liqueurs like Baileys – there use to be just one variety and now you get choices – gets confusing sometimes. I’m with you on that! I need to break out every now and then with a new cocktail!! It’s like that with almost everything!! You should have seen how long it took me to pick out pickles the other day, lol!!! Pins colada without the alcohol – very clever! I think I was very young then, maybe late 20’s – and I still love making this!! Genius save! I’ll have to remember this next time I need to make a fruit salad. I usually just add orange juice but this sounds so much tastier! Yeah, instant gratification! 🙂 I remember a few times being asked for the recipe and being just slightly embarrassed!! What a fun idea! Sometimes those “oh crap” moments make for the best discoveries! It really is pretty, isn’t it! It’s the blackberries that make it, I think!